On March 26 from 1:30 – 2:30 p.m., DHHS will hold a stakeholder webinar to provide the specifics of Tailored Plan eligibility criteria, enrollment processes, and transitions between Standard Plans and Tailored Plans. On March 18, 2019, DHHS released a final policy guidance paper on these key concepts. The full paper can be found at https://files.nc.gov/ncdhhs/BH-IDD-TP-FinalPolicyGuidance-Final-20190318.pdf. Additional information may be found on the NC Medicaid transformation website at www.ncdhhs.gov/nc-medicaid-transformation. Never drive through standing water – turn around, don’t drown! Download the ReadyNC app to a smartphone – provides details on how to prepare an emergency kit, where shelters are open, and other essential information. ReadyNC also may be accessed at https://readync.org/EN/Index.html. Look out for NC Emergency Management’s latest updates at https://www.ncdps.gov/florence. From technology and patient needs to payment models and innovative partnerships, trends are converging in a rapid and exciting fashion. We’re all in it together: patients, physicians and care providers, and payers. UnitedHealthcare Community Plan shares your commitment to delivering a superior patient experience and improving health outcomes. We believe that the best solutions come when we work together with care providers. We share the power to chart a new path, creating a stronger health care system that works better for everyone. And we’re ready to support you with tools and data resources designed to help you serve your patients and allow your practice to thrive. Health care is constantly changing in North Carolina and throughout the country, and all stakeholders – individuals, care providers, community partners and federal and state governments – feel the impact. In the face of this changing landscape, the business and social mission of UnitedHealthcare will always remain the same: To help people live healthier lives and to help make the health system work better for everyone. We have a long history in the great state of North Carolina and are proud of our record improving the health of more than 1.4 million people we are privileged to serve through the delivery of quality, cost-effective health care. We are committed to continuing to serve North Carolinians and working together to move the new Medicaid program forward today and for the future. Beginning July 1, 2018, UnitedHealthcare will reimburse Primary Providers for CPT Code 99051 “Services provided in the office on evenings, weekends or holidays when Office is normally schedule to be open” when billed with a non-preventative office visit. 99051: Eligible expenses for after-hours health services will be reimbursed at a value determined using the alternate of (‘gap-fill’) Fee Source as CMS does not publish an RVU value for the code. This policy update will be effective for claims with dates of service July 1, 2018 and after. A national policy update will be implemented later in 2018. If you have any questions about this policy update please contact Provider Relations at Carolinaprteam@uhc.com and include your practice name, tax ID number and National Provider Identifier to assist us in identifying your assigned Advocate. The reimbursement rate for CPT code 99051 will be available via the fee schedule lookup tool in Link beginning 07/01/2018. Attendees learned about the future of many different healthcare issues that will affect our state both now and in the future, including Medicaid Managed care, new legislation impacting our provider networks, and updates on hot healthcare topics currently being debated in Raleigh. In addition to the education sessions, attendees enjoyed the opportunity to engage with peers from other practices; they were able to proactively share challenges and solutions. Finally, several attendees of the legislative visits also learned a great deal about what actually happens at the legislative level when concerns are raised by the public (when visiting the legislature, that’s US!). Attendees were able to witness and talk to the people who establish the criteria for what is heard by our lawmakers and also HOW it is being heard from different constituencies. They saw the true impact of what it means to make sure your voice is represented. 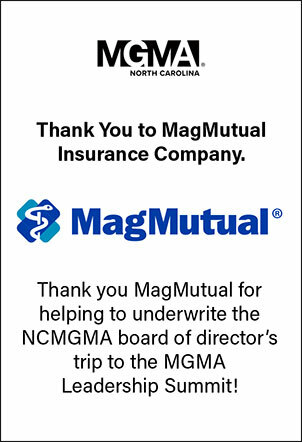 The Advocacy committee and NCMGMA Board would like to thank all the attendees for participating. Though our positions are sometimes varied, we do many times speak with a singular voice on many of the issues facing our practices. Your active participation in both education and advocating for our practices is invaluable; we thank you for making our organization a success!